New Green Lasers Made at Princeton Univ. When most of us think about lasers, we never even stop to wonder if there are different types of lasers. We kind of just assume that a laser is a laser, like a peanut is a peanut. This assumption however is false. There are many different types of lasers and a new one has just been developed. A Princeton-led team of researchers has discovered an entirely new mechanism for making common electronic materials emit laser beams. "This discovery provides a new insight into the physics of lasers," said Claire Gmachl, who led the study. Gmachl, an electrical engineer, is the director of the Mid-Infrared Technologies for Health and the Environment (MIRTHE) center. The phenomenon was discovered in a type of device called quantum cascade laser, in which an electric current flowing through a specially designed material produces a laser beam. Gmachl's group discovered that a quantum cascade laser they had built generated a second beam with very unusual properties, including the need for less electrical power than the conventional beam. "If we can turn off the conventional beam, we will end up with a better laser, which makes more efficient use of electrical power," said Gmachl. So basically what was discovered was a new layer of lasers. One that we have never be able to make use of before, but that could have a potential cost savings in power consumption. It's kind of like lasers and going green. What exactly is a laser anyway? Well, the scientific explination goes a little bit like this. The light emitted by a laser differs fundamentally from light produced by common sources such as the sun, fire, or electric lamps. According to the field of physics called quantum electrodynamics, light is made up of particles called photons. Common sources of light emit photons that are in a random order, like crowds milling about a busy marketplace. In contrast, photons in a laser are "in sync" with each other, like a music band marching in formation. This property, called coherence, allows laser light to shine in an intense, narrow beam of a single, very pure color. Where can this new laser find a home outside the lab? Unlike other lasers, quantum cascade lasers operate in the mid- and far-infrared range, and can be used to detect even minute traces of water vapor, ammonia, nitrogen oxides, and other gases that absorb infrared light. As a result, these devices are finding applications in air quality monitoring, medical diagnostics, homeland security, and other areas that require extremely sensitive detection of different chemicals. The new discovery should help make these devices smaller, more efficient, and more sensitive, said Gmachl. You should really re-think the title of this article. This title is horribly misleading. The laser does not emit green light! 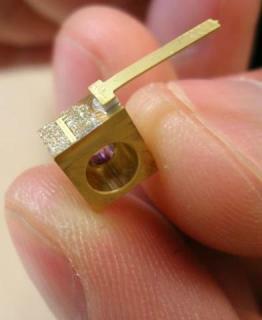 As you explain in the article, the laser emits infrared light. The discoveries reported by the Princeton group may one day lead to more efficient laser devices. Why is this useful? These mid-infrared quantum cascade lasers are usually horribly inefficient, which dramatically limits the output power of the laser. One day, we may be able to do things like blind heat seeking missles for defense countermeasures with these devices, but we're going to have to make the more powerful first. Making the lasers more energy efficient is the way to get there. Also, other applications for mid-infrared light have "green" applications, such as environmental monitoring for green house gasses and pollutants. But... this is not a green laser!